Get a realistic perspective of what’s involved in the move, the resources and support available to ease the process, and how MicroStation can actually make your job easier in the long run. Let’s be honest: Transitioning to new CAD software is not an item that appears on any CAD manager’s bucket list. Most of the burden of such a move falls squarely to the CAD manager, from software implementation and customization to user training and support. It’s all very daunting. And yet, the payoffs of new CAD software could make life so much better for a CAD manager, not to mention for CAD users and for the company as a whole. What’s the answer? This article aims to address the concerns of the CAD manager when it comes to transitioning from AutoCAD to MicroStation, painting a realistic picture of what’s involved in the move, the resources and support available to ease the process, and how MicroStation can actually make a CAD manager’s job easier in the long run. With the support of Bentley Systems, developer of MicroStation, CAD managers stand every chance of success, and have everything to gain, in moving to MicroStation. A CAD software change seems overwhelming and fraught with unknowns. Decide who should oversee installation. Will the actual software installation fall to you or the IT department? If you’ll share the job, how exactly? Set clear expectations and boundaries from the start. Determine what you need and how you’ll install it. How many MicroStation licenses do you need, and what combination of perpetual and subscription licenses will best meet your short- and long-term needs? Will you do an out-of-the-box installation or will you require a customized deployment? Bentley experts can guide you through this process. Install. Most companies don’t need new hardware if moving from AutoCAD to MicroStation, so once you have the new software, you’re ready. Installation typically takes five minutes per machine, and deployment images can be used for remote installation on many machines across a network. Educate. Up-front learning will pay off in spades down the line — for users and for you. Resources and options are plentiful for all stages and types of learning, as detailed below. Jump right in, or take it slow. In this day and age, who has time to configure software and achieve proficiency before moving the new tools to production? Some companies today, especially smaller ones, find success in launching new software and a new project simultaneously, learning and fine-tuning in real time. MicroStation is completely flexible and customizable to your needs, so you can certainly set up permissions, workspaces, and other features before going live. But MicroStation also works right out of the box without a single modification so you can dive in, start learning and being productive right away, and customize as you go. It’s entirely your call. Bentley provides a detailed, step-by-step checklist for CAD managers to guide you through MicroStation implementation. I’ll be on my own to figure this out. The opposite is true: Bentley takes customer service and support very seriously. Technical support is available 24/7/365. Bentley provides implementation guides and checklists to walk you through MicroStation deployment, software customization, and other stages of implementation and to ensure you don’t overlook anything important. And Bentley Communities members are a great resource any time you need the advice or expertise of peers. For CAD managers eager to become MicroStation experts or make transition from AutoCAD without direct support from Bentley, CAD management training courses are available in person or on demand. Optional Bentley professional services can provide any level of support you need to plan and carry out your MicroStation implementation and training. Bentley will always have your back — before, during, and after software implementation — and that’s a commitment, not an empty promise. As an Autodesk customer, you’ll likely be surprised by the level of support you receive directly from Bentley. The company wants you to be successful and satisfied using its software. Take a tour now of MicroStation learning resources and Bentley Communities for a first-hand look at just some of the help at your disposal. We have so much invested in AutoCAD — money, time, data. It’s not easy to think about moving. MicroStation includes Autodesk’s own RealDWG libraries, so you can use and produce DWGs without any time-consuming and risky conversion, and be confident that the.DWG files created in MicroStation will move seamlessly back to AutoCAD (with support for version R12–present). MicroStation does not support AutoLISP, but it does support VBA as well as .NET, C++, and C#. It also offers several other ways to customize functionality, including easy script creation and element templates. Regarding time and money invested in AutoCAD: You must tackle this major decision objectively. Don’t allow yourself to be overwhelmed by what you’ve sunk into your current solution — that’s an emotional response, and not one that’s good for business. A decision regarding the best CAD software for your business should be objective — that is, based on what that software can deliver in the future. Need more help in overcoming the natural inertia you might face at the prospect of a major software transition? See “Move Past the AutoCAD Ties That Bind” for advice. My CAD users are going to have a difficult time making this move. Actually, expert AutoCAD users are more than half way to being MicroStation experts. Once training is complete, users shouldn’t need more than a week of regular MicroStation use to get comfortable. As with any sophisticated software, users will achieve proficiency and mastery with continued use over time. But some things will be unfamiliar, which is why up-front training is so important. Beyond that, you and your users can depend on the extensive learning resources available. Bentley SELECT subscribers — the majority of customers, according to Bentley — have unlimited access to 100% of an extensive library of learning content, all from within the MicroStation interface, including courseware, hundreds of hours of feature and workflow videos, a database of documented issues and solutions, and answers to frequently asked questions. Round-the-clock technical support as well as peer support via Bentley Communities also are at your fingertips, whether you’re looking to shorten the on-boarding process, resolve a technical question, advance skills, or improve workflows. A special collection of MicroStation learning content is dedicated to AutoCAD users, and a Quick Reference guide makes it easy to learn old-vs.-new terminology, clarify features, and resolve other common productivity bottlenecks. And there is a whole library of live and on-demand learning resources specifically for CAD managers to become experts in managing MicroStation. Some frustration is inevitable with any major change. The key is how well you’re equipped to deal with it — and with Bentley’s extensive support tools and services available around the clock, you and your users will be able to efficiently resolve most any issue. Meanwhile, such instances will dissipate with each passing day and satisfaction with MicroStation will grow as each user becomes increasingly familiar with the new tools and benefits. Avoid setting goals to reach high software utilization rates early on, as this pressure can actually become a barrier to user success. Establish realistic goals that build in time for learning and troubleshooting. My workflow will change completely. The truth is, you’ll find yourself in fairly familiar territory when you move from AutoCAD to MicroStation. For the most part, supporting MicroStation users is very similar to supporting AutoCAD users, and with all the similarities in features between AutoCAD and MicroStation, you’ll have a solid foundation to build on before you even begin. Better product stability and file integrity. With MicroStation, you and your users can eliminate the risk of software crashes that are common with other CAD applications — and the lost work, corrupted files, and wasted time that result. Extensive file format continuity. Bentley is extremely consistent when it comes to file formats. The current format (v8) has been in use since 2003, and even files in the previous format can still be used. And this goes not just for MicroStation, but for most other Bentley applications. You can say goodbye to the headaches that come with frequent file format changes. Comprehensive software compatibility. You can also say goodbye to patched-together software foundations. CAD managers working with Autodesk products often find themselves addressing software interoperability problems with a band-aid, a cast, or a body cast to make it work, and over time you can lose track of how much pain and difficulty you have invested in making things work. Not so with Bentley Systems software: MicroStation and all Bentley building information modeling (BIM) applications are built on the same comprehensive modeling platform. That means users can easily share files bidirectionally and work in similar user interfaces across applications, out of the box, which makes everyday life for the CAD manager so much easier, in addition to reducing costs, complexity, and the learning curve when adopting new tools and advancing to full BIM workflows. Market-leading CAD standards enforcement. MicroStation greatly facilitates the proper application of organizational and project-specific standards and content — in fact, its unique CAD standards support is one of its greatest strengths over AutoCAD. CAD managers can easily apply templates to control geometry and data standards such as styles for dimensions, text, lines, detail symbols, and more; organize and manage libraries of components (such as windows, door, pipes, and pumps); and simplify the process of finding and sharing project-specific files and content. Once designs are complete, use automated tools to check drawings for standards compliance. MicroStation also makes it easier to manage design changes and to control and protect files. Easier software support. You’ll most likely have fewer software applications to support as well, because MicroStation alone is capable of tasks that require multiple, separate applications if you’re an Autodesk user, including file sharing, file review and mark-up, design visualization, point-cloud processing, project management, and more. More effective collaboration. Not only do data and software play well together in the Bentley ecosystem, but so do people. Bentley’s dedication to software and data interoperability means its users can reliably interoperate with the rest of the world, working with just about anyone to deliver any project. Bentley developers have solved interoperability problems so you don’t have to. Better change management. Using MicroStation’s out-of-order undo functionality, users can review and undo single design changes of the past to make corrections or updates without having to undo everything since then. Not only that, but you can visually compare a design at two points in time to better understand which changes were made as well as who made them and when. And this capability is even more powerful when coupled with the tightly integrated Bentley ProjectWise worksharing and collaboration software. Efficient software license management. If you are responsible for administering software for your organization, Bentley provides tools to manage license access, download software, set user permissions, analyze license use, manage notifications, and more. Built-in BIM preparedness. Last but not least, MicroStation positions you, your team, and your company for the future. Its range of BIM-like functionality and workflows and its ability to deliver data-driven, BIM-ready models mean your deliverables can extend beyond geometry and drawings. MicroStation’s robust information handling, paired with its mature and powerful modeling capabilities, make it a natural next step toward the world of BIM and all its benefits. As you consider the payoffs of a move to MicroStation, look at the software not only as the cure for many current CAD headaches, but also as a strategic tool that will support the growth of your CAD team and position your company to respond to ever-changing competitive challenges and opportunities. Here, Bentley's MicroStation Maxine responds to reader questions. Have a question of your own? MicroStation Maxine is standing by to help! Click here to submit. And visit the Switching Center on Cadalyst.com to access a growing collection of information and advice for AutoCAD users considering a move to MicroStation. Q: What learning tools are available for MicroStation, and is there a cost? What is the cost of the system with the AutoCAD perpetual license promo? A: The vast majority of MicroStation users are also Bentley SELECT subscribers (our comprehensive program for the support of MicroStation — which has a whole range of benefits). As a SELECT subscriber, you can use an in-application learning tool called CONNECT Advisor, which provides you with full access to thousands of learning videos, quick start guides, help and wiki materials, schedules of upcoming virtual learning opportunities, and even contextual advice for tools and workflows based on how you are using the software. All of this content has been created by Bentley experts and is used by hundreds of thousands of users worldwide. The list price of a perpetual license of MicroStation is just slightly more than the AutoCAD perpetual license before any discounts — but Bentley also offers annual and quarterly subscription options. A Bentley sales colleague could certainly share the specifics with you and let you know which perpetual discount level you would be eligible for under the AutoCAD perpetual license promo, so you can compare your options. Q: What is the cost for a single license of MicroStation for architecture? A: The list price for a perpetual license for MicroStation is similar to what a full license of AutoCAD used to be, though prices vary in different countries. There are also a variety of subscription licensing options available, depending on your needs. Bentley also offers an architectural BIM application called AECOsim Building Designer that is built on the same comprehensive modeling platform as MicroStation that you may wish to investigate; its price is very similar. Q: Please provide purchasing and licensing information. A: To get more information on pricing and licensing, you can contact Bentley directly by phone at 1-800-BENTLEY or online. MicroStation’s perpetual license price and annual subscription licensing are comparably priced to AutoCAD, though prices vary by country. If you are instead looking for a drafting solution, MicroStation PowerDraft may be a more cost-effective and robust alternative (comparable to AutoCAD but without the ability to create 3D models). Are you looking to explore CAD software licensing options? Watch this short video to see why Bentley's licensing options are so unique. 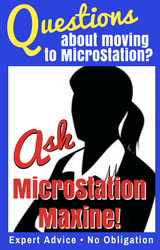 Wondering where to begin learning more about MicroStation? You can dive into the basics and even download a MicroStation 14-day trial at www.Bentley.com/MicroStation.